Help the ACT Government ensure future developments support healthy living in the ACT by embedding active living principles into the Territory Plan. Community engagement closed on 10 February 2017. Have your say on changes to the Territory Plan. These changes are a major step towards the ACT Government's vision for Canberra as a healthy, active, vibrant city. Territory Plan Draft Variation 348 (DV348) supports our city to be well connected, compact and equitable; and the centre for innovation, creativity and economic growth. Active living is a way of life that integrates physical activity into daily routines, such as walking the dog or taking the stairs instead of catching the lift. The planning and design of our city plays a major role in how much active living we undertake in our daily routines. DV348 will help Canberrans meet the National Physical Activity Guidelines on a regular basis. DV348 will ensure all future development applications consider six active living principles to encourage healthy active lifestyles. Among other things, building and estate designs will need to include good connections to walking and cycling paths, activate public spaces, and encourage physical, social, and economic activities. The proposed changes include amending the Territory Plan's Strategic Directions, Zone Objectives, several development codes, a general code, the Estate Development Code and adding the definitions for active travel and active living. The Statement of Planning Intent (2015) made by the Minister for Planning and Land Management identifies, as an immediate action, incorporating active living principles into Canberra's planning and statutory framework (the Territory Plan) in all aspects of future planning and development. Doing this requires a variation to the Territory Plan, which is approved by the Minister and tabled in the Legislative Assembly. Environments for all - Ensuring places are inclusive and have equitable access by all Canberrans. These principles are intended to be embedded into the Territory Plan through 45 specific recommendations under Territory Plan DV348. The recommendations are based on: detailed advice from the Heart Foundation (ACT); extensive research from local, national and international case studies; actions from relevant strategic government policy; and input from stakeholder discussions. Incorporating these specific recommendations into the Territory Plan will create a supportive environment for a healthy, active Canberra. Your comments will be taken into consideration during the finalisation of DV348. The Minister for Planning and Land Use Management will be provided with a report on public comments and how these have been addressed when he receives DV348 for consideration. If approved, all new developments will be required to address the active living principles, which in turn will encourage Canberrans to live an active and healthy lifestyle. Register your interest to receive updates on upcoming community consultations or updates on DV348. Corner or Petrie St and City Walk. What is the Territory Plan? Active living is a way of life that integrates physical activity into daily routines. Active travel is defined as physical activity undertaken as a means of transport and not purely as a form of recreation. Active travel can include walking and cycling – as well as skating, skateboarding, and the use of mobility aids. Active travel also includes using any of these forms as incidental activity associated with the use of public transport. The Territory Plan is the key statutory planning document for the ACT, providing the policy framework for the administration of land use and planning. What does draft variation 348 involve? The ACT Government, in partnership with ACT Government representatives, the Planning Institute of Australia, and the Heart Foundation (ACT), has developed six active living principles which relate to how Canberra is planned and built. 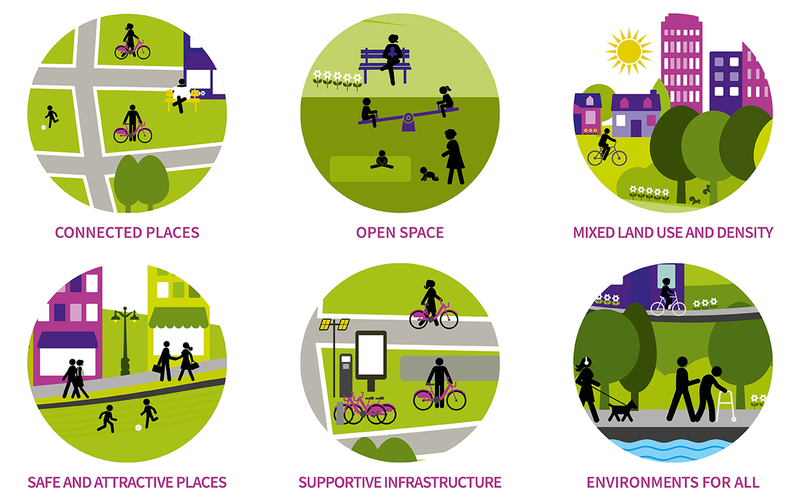 The draft variation will embed the six active living principles - connected places, open space, mixed land use and density, safe and attractive places, supportive infrastructure and environments for all - in the Territory Plan and become integral to all future development in the ACT. What information and/or research is DV348 based on? The draft variation is based on advice from the Heart Foundation, extensive local, national and international case study research, actions from government policy and input from stakeholder discussions. It comprises 45 recommendations to amend relevant parts of the Territory Plan. Why is the ACT Government including active travel principles in the Territory Plan? Active living is about incorporating physical activity in daily routines to help address the high rates of obesity and overweight, and the associated health problems that are causing illness and increasing our health costs. Research shows that including active living principles in the Territory Plan will encourage the population to be more active, which leads to a more socially connected, prosperous and healthy population, and a city that is more attractive with a lower carbon footprint. How will these changes impact the ACT community? The ACT Government’s vision for Canberra is to be a healthy, active, vibrant city that is well connected. Active living is integral to this vision. While Canberra has many facilities that support active living and active travel - such as parks, bushland, recreation areas and bike paths - Canberra’s low density, dispersed nature means private vehicles are still the predominant mode of transport. The draft variation will lead to urban environments that promote active lifestyles and an economically, environmentally and socially thriving city. If DV348 is approved, all new developments will be designed to encourage Canberrans to live active and healthy lifestyles. Anyone making a development application will need to address active living in their application.